IT'S BRIGHT, IT'S FRESH, IT'S LOUD, IT'S ORANGE! With Spring/Summer around the corner, this season's hottest colour is Orange! So ladies, invest in at least one bright orange accessory either shoes or a bag. 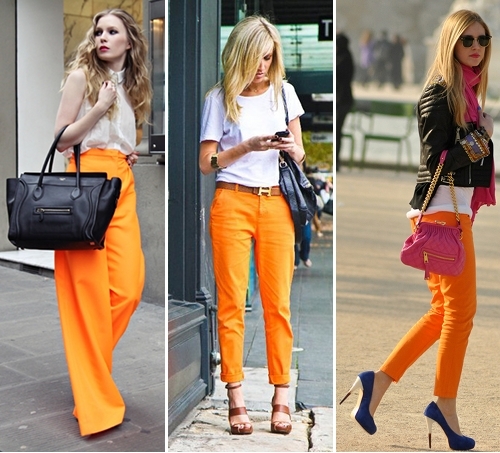 If you're looking for more colour on you, buy an orange jacket/cardigan or be different and purchase orange pants! But a big must have for Spring/Summer is a LOD (Little Orange Dress). Please scroll down to know more. 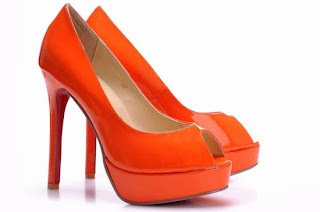 Invest in a bright orange pair of shoes.Orange pumps and wedges should be on your list of things to buy. Orange has replaced the "Little Black Dress (LBD)" with the "Little Orange Dress (LOD)" and many celebs are now sporting this look. And it's time we do too. I'm gonna go get my LOB soon, when are you? If you have one, please share it with us on Tricks Of The Trade-2 by sending your picture to khan.sanaa@hotmail.com. Even Katie Holmes daughter, Suri is catching up with the 'LOD' trend.